The Shakopee Mdewakanton Sioux Community (SMSC) and Mystic Lake Casino Hotel broke ground today on a new hotel tower and state-of-the-art convention center called “Mystic Lake Center.” The project, to be built by PCL Construction, is expected to create up to 400 construction jobs and approximately 100 permanent jobs. 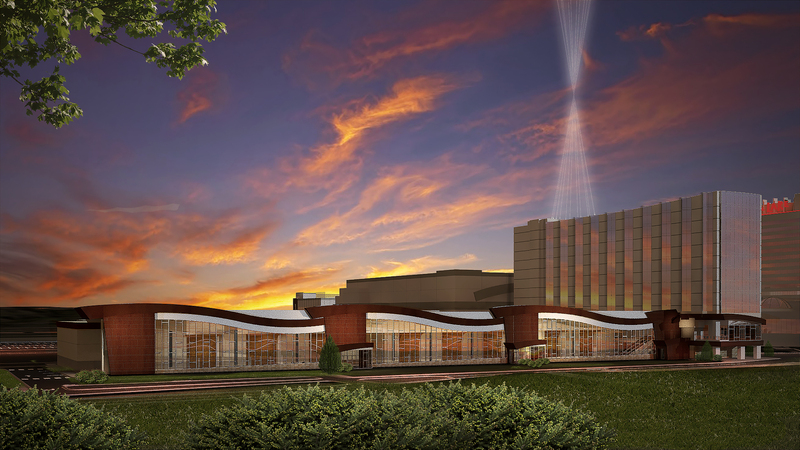 Click here to view a photo rendering of Mystic Lake Center. Click here to watch a virtual tour of Mystic Lake Center. Mystic Lake’s new nine-story hotel tower will feature 180 rooms, nearly all of which will capture a stunning western view of The Meadows at Mystic Lake championship golf course. When the project is complete, Mystic Lake Casino Hotel will be the second-largest hotel in the metro area. Mystic Lake will also complete a full remodel of its existing 586 hotel rooms this summer. Mystic Lake Center will include a 70,000-square-foot meeting and event center with three-story windows overlooking The Meadows at Mystic Lake. The facility will include two large ballrooms, several smaller breakout meeting rooms, and an executive boardroom with a balcony overlooking the golf course. The Shakopee Mdewakanton Sioux Community is a federally recognized, sovereign Indian tribe located southwest of Minneapolis/St. Paul. With a focus on being a good neighbor, good steward of the earth, and good employer, the SMSC is committed to charitable donations, community partnerships, a healthy environment, and a strong economy. The SMSC, with its Gaming Enterprise and various other enterprises and tribal employees, is the largest employer in Scott County. Out of a Dakota tradition to help others, the SMSC has donated more than $325 million to organizations and causes and has contributed millions more to regional governments and infrastructure such as roads, water and sewer systems, and emergency services. The SMSC is the largest philanthropic benefactor for Indian Country nationally and one of the largest charitable givers in Minnesota. Visit Mystic Lake in RiverSouth – Land of Big Fun! RiverSouth is a joint public-private collaboration promoting premier entertainment destinations just minutes south of Minneapolis. With four of Minnesota’s biggest attractions just four miles apart, there’s fun around every bend. Partners include Canterbury Park, Mystic Lake Casino Hotel, Valleyfair, the Renaissance Festival, Shakopee Mdewakanton Sioux Community, and the cities of Prior Lake and Shakopee.